• Identify the activities, resources, and procedures needed to carry out NPIRS processing requirements during prolonged interruptions to normal operations. • Assign responsibilities to designated OIT/NPIRS personnel and provide guidance for recovering NPIRS during prolonged periods of interruption to normal operations. • Ensure coordination with other OIT/NPIRS staff who will participate in the contingency planning strategies; ensure coordination with external points of contact and vendors who will participate in the contingency planning strategies. 5300 Homestead Rd., Albuquerque, New Mexico. • A national emergency such as a war involving the United States Armed Forces, an attack on the U.S., or any threat to the continuity of the Federal Government. • Natural and technological disasters such as radiological incidents or emergencies, hazardous materials (HAZMAT) incidents, and environmental disasters. • Events declared by the President of the Unites States to be major disasters, or emergencies under Public Law (P.L.) 93-288, the “Robert T. Stafford Disaster Relief and Emergency Assistance Act,” as amended. • Civil disorders, terrorism, or other violent acts. • Any situation that substantially disrupts normal operations of the OIT Albuquerque Office. An EOC is the location designated by this Plan where operations will continue in the event of an emergency. The alternate site will be used to continue Public Data recovery and processing throughout the period of disruption, until the return to normal operations. OIT will use the alternate site’s IT resources to recover the Public Data during an emergency situation that prevents access to the original facility. The designated systems at the alternate site can be configured to restore the Public Data and make it available to IHS staff by Virtual Private Network (VPN). • NPIRS is inoperable at the OIT/NPIRS computer center and cannot be recovered within 72 hours. • Key NPIRS personnel have been identified and trained in their emergency response and recovery roles; they are available to activate the Emergency Management Plan for NPIRS. • Computer center equipment, including components supporting the NPIRS, are connected to an uninterruptible power supply (UPS) that provides 45-60 minutes of electricity during a power failure. • Current backups of NPIRS application software and data are intact and available at the offsite storage facility. • Equipment, connections, and capabilities required to operate NPIRS are available for delivery at the OIT/NPIRS original site in Albuquerque, New Mexico. • Equipment, connections, and capabilities required to operate NPIRS are available at the alternate site in Albuquerque, New Mexico. • Service agreements are maintained with NPIRS hardware, software, and communications providers to support the emergency system recovery. • If applicable, related contingency plans are in process to include the Integration Engine and adequate communication links for receiving export data, as well as general communications. 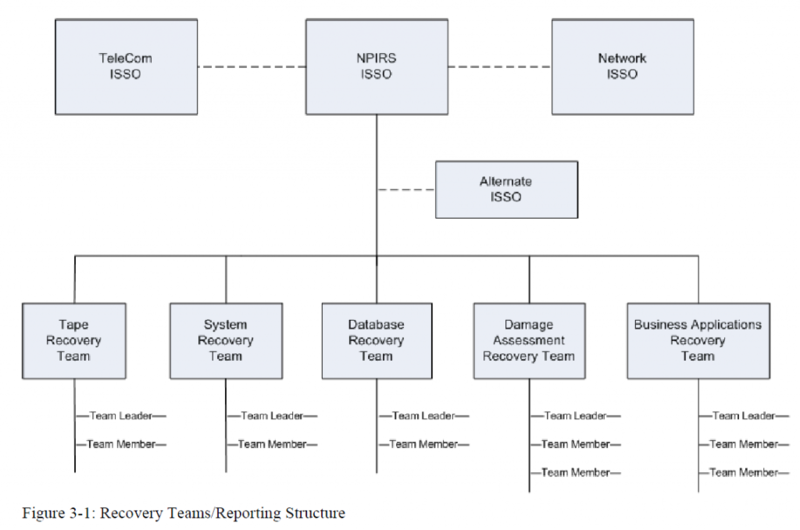 • Overall recovery and continuity of business operations. This plan is an Annex to the Office of Information Technology Business Resumption Plan (BRP) and Emergency Management Plan (EMP), which includes the Continuity of Operations Plan (COOP). • Emergency evacuation of personnel. Refer to the Building Emergency Management Plan for the Occupant Evacuation Plan (OEP). The National Patient Information Reporting System (NPIRS) stores information related to Native American patient and health care facilities. This national data repository is commonly known as the National Data Warehouse (NDW). The NDW is the central data repository for all Indian Health systems. 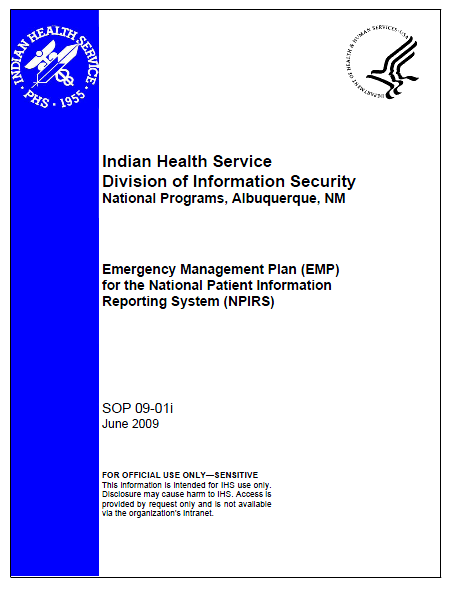 It provides the data for various data marts that, in turn, support IHS statutory, regulatory, and administrative obligations, including user population counts, workload reporting, epidemiological non-standard reporting, accreditation, and Government Performance and Results Act (GPRA) performance measurements to meet the mission and business requirements of the Indian Health Service. The Office of Information Technology (OIT) sets forth an order of succession in coordination with the order set forth by the Department, to ensure that decision-making authority for the OIT Emergency Management Plan is uninterrupted. 1. The Chief Information Officer (CIO) is responsible for ensuring the safety of personnel and the execution of procedures documented within this Emergency Management Plan. 2. If the CIO is unable to function as the overall authority or chooses to delegate this responsibility to a successor, the Deputy Chief Information Officer (DCIO) shall function as that authority.